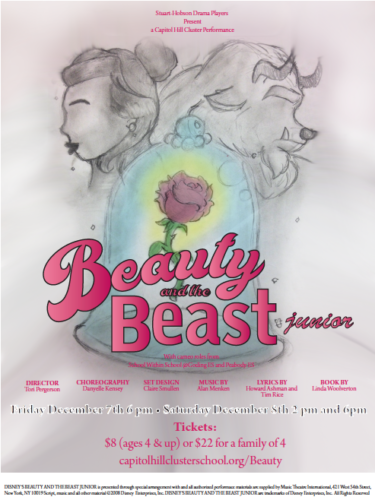 Support the Stuart Hobson Drama Players: Beauty and the Beast, Jr! Are you looking for a FUN, cheap, family-friendly activity that is produced almost entirely by middle school students? Look no further than Stuart Hobson Middle School’s production of Beauty and the Beast, Jr., playing this weekend! Join the Stuart Hobson Drama Players as they bring a tale as old as time to vibrant life. Under the guidance of the incredible Ms. Tori Pergerson, the players have been working hard for months, designing costumes, sets, lighting and sound in order to bring three incredible performances to life. Also, prepare to be bowled over by the cute: Students from Peabody and School Within School will be featured in cameo roles! It’s no understatement to say that we are very lucky to have such a great theater arts program in the heart of the Hill. WHAT: Stuart Hobson Middle School’s production of Beauty and the Beast, Jr. WHEN: Friday, December 7 at 6 p.m. and Saturday, December 8 at 2 and 6 p.m.
WHERE: Stuart Hobson Middle School Auditorium, 410 E Street NE. For tickets, click here. WHY: It’s impressive what 11-13 year olds can do when they are directed by a talented mentor and teacher. I guarantee you will laugh, sing and dance. Plus, your contributions help the Capitol Hill Cluster School keep up their amazing teaching and instructional standards. What’s not to love?